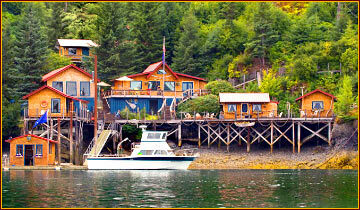 “Experience the Magic of Halibut Cove, Alaska. For 2018 Quiet Place Lodge will be a "Concerts Events Destination" and not booking private stays. We will be hosting three music events this summer 2018. For tickets and information...... Please click on the link "Halibut Cove Live" to view upcoming events. Give us a call @ 907-235-1800 or E-mail us @ quiet@alaska.net. See you in the Cove! A beautiful 4-5 hour drive or 45 minute scenic flight from Anchorage gets you to Homer. From Homer, a 6 mile boat ride will deliver you to the serene wilderness experience of Quiet Place Lodge, a part of a unique community of artists and fisherman. The newly renovated lodge, library/common area, and cabins house an eclectic collection of art and antiques. The Los Angeles Times travel section named Halibut Cove the "favorite discovery of the year."